Discussion in 'News and Announcements' started by Shaun-HiFi, Apr 15, 2010. 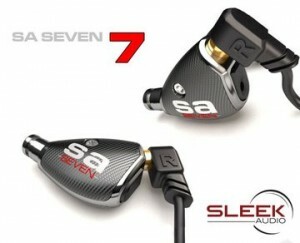 Sleek Audio have finally unleashed the eagerly awaited SA7 earphone on the World. The SA7 is the new high end in ear monitor (IEM) from Sleek Audio with the earphone featuring a milled aluminium body, carbon fibre cladding and dual wideband balanced armature drivers. 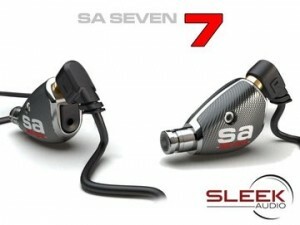 Built to last, the SA7 earphone will appeal to those who get through high end earphones at an alarming rate. Replaceable cables and a robustly constructed earphone body ensure the SA7 is maintainable for many years to come. Milled aluminium earphone body - built to last the SA7’s earphone body will withstand the toughest environment, with the internal speakers wrapped in shock absorbent silicone and able to withstand 14000 G. The earphone body is shrouded in carbon fibre for a durable finish. Dual wideband balanced armature drivers - offering complete coverage of the entire audible frequency range the SA7’s dual driver design promises more than enough power for the lowest bass notes, while reproducing high frequencies with clarity and definition. Wired or wireless options - the SA7 can be hooked up with cables or via the optional wireless adapter that uses the high fidelity Kleer wireless audio transmission protocol (uncompressed and very close to the sound quality offered by cables - also used in Sennheiser wireless headphones). Adjustable Sound Signature - by changing the treble filter or bass port on the earphone body you can tune the SA7 to suit your musical tastes. First featured on the Sleek Audio SA6 and later on the SA1, the new SA7 lets you find a sound that suits you perfectly. Replaceable Cables - as with the entire Sleek Audio range if you break a cable it’s not the end of your earphones. The SA7’s robust earphone design and replaceable cables means you can expect to keep this earphone for a very long time. Sleek Audio have been innovators from the beginning and the SA7 underlines their position as a company willing to push the boundaries of what can be expected from an earphone. We love the bold design and applaud the fact that Sleek Audio have taken durability so seriously with the SA7. Earphones are often very easily broken and it’s great to see a manufacturer making such efforts to produce a product that is maintainable over a longer period of time. We have not yet heard the SA7, but if the SA1 and SA6 are any measure of performance the new flagship earphone from Sleek Audio is set to offer a high end listening experience that will keep audiophiles more than satisfied. For more information on the Sleek Audio SA7 and the rest of the Sleek Audio earphone range please check out the HiFi Headphones web store.